A women’s health service in California has come under fire for dumping a woman because she would not consent to a c-section. 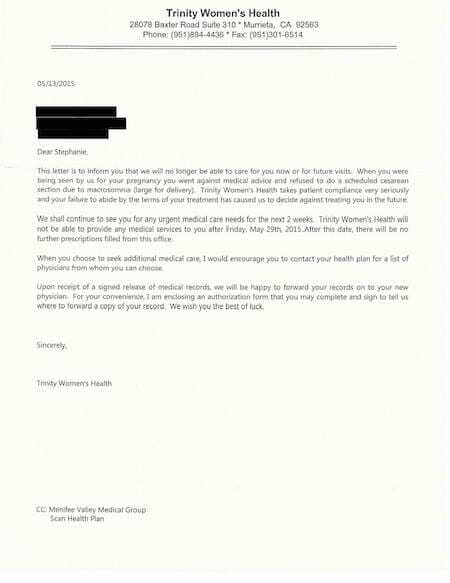 In a letter to Stephanie Lyn Dobson, Trinity Women’s Health Service (TWHS) in California stated that she ‘went against medical advice and refused to do a scheduled cesarean section due to macrosomnia (sic)’. Because of this refusal, TWHS opted to not treat Stephanie in the future, even though she was already in her third trimester. The letter sent to Ms Dobson was dated mid May, 6 weeks after she gave birth to her baby with another caregiver. Aside from the very glaring error in the quoted sentence, there is also a glaring omission: actual diagnosis of fetal macrosomia (large baby over 4500g) is possible only once the baby is born and can be weighed. Before birth, macrosomia is suspected only. Estimation of a baby’s weight while in utero is not easily done or very accurate. The main methods used to estimate a baby’s weight in utero are Leopold’s maneuvers (palpating the uterus/baby) and measuring the height of the fundus. Both of these methods can vary considerably, and used alone are not accurate predictors of fetal macrosomia. Ultrasound is another method to assess a baby’s estimated size but it is no more accurate than Leopold’s maneuvers. The letter to Ms Dobson further pointed out that ‘Trinity Women’s Health Service takes patient compliance very seriously’. In the current birth climate, informed consent is a hot topic. More and more women are coming forward to report experiences of coercion and non-consensual procedures occurring during pregnancy and labour. Ms Dobson’s right to refuse a c-section is in line with the current practice guidelines of ACOG, yet TWHS sees her informed refusal as not being compliant with their expectations of her treatment. While doctors do have the right to dismiss patients from their care for a number of reasons, maternity patients are afforded certain protection against dismissal. According to the American Medical Associations Code of Ethics, doctors have an obligation to continue to support continuity of care for their patients. Women who are in their last trimester and within a few weeks of giving birth should not be dismissed from their doctor’s care unless under extreme circumstances (such as doctor illness). Some supporters of TWHS believe they were within their rights to write to Ms Dobson, stating litigation prevention provides reasonable grounds to dismiss her from their care (the full letter from TWHS can be seen below). In 2012, ACOG’s Survey on Professional Liability revealed 58% of obstetricians change their practice due to fear of litigation. In recommending Ms Dobson complies with an elective c-section against best practice guidelines, TWHS is practicing defensive medicine, exposing her and her baby to risk of injury and death. Ms Dobson has since vaginally birthed her baby, who was caught by a nurse just 30 minutes after arrival at the hospital. Her baby weighed 4.5kg (9lb 15oz). Hardly worthy of a c-section. It’s easy to scare pregnant women about the health of their baby in order to manipulate them into doing everything the care provider’s way. But birth is not a disease, and there are a wide range of treatment options for labor and birth. Reading the letter from the clinic was appalling. What about her right to shared decision making? The respect they owed her and her right to have patient autonomy over her body? There is real danger in handing over total responsibility for your health to the medical profession, but this clinic’s bullying and condescension show what an uphill road it is to be an active, responsible participant in your own care. I urge women to spend the time to interview providers and ask tough questions, and look into midwifery care even if they plan to use an OB so they can experience what it feels like to be listened to and respected. It’s time for women to raise the bar of our expectations for birth. We should all insist on better care in birth and refuse to be shamed or managed by providers. What I find appalling is your use of fear mongering to get people on your band wagon. This letter was dated AFTER she delivered. She was not “dumped” while “heavily pregnant.” You need to fact check. I saw the original post from Stephanie herself. Not only did they follow her during her delivery time, they even kept her on as a patient until her postpartum period was up. And just so you know, being as they are NOT a hospital, they are not required to see anyone that they don’t want to. It’s not a hospital or immediate care center, it’s a doctor’s office. They absolutely have the right to decline. I had to change care near the end of my pregnancy and while it was stressful, it would have been a lot worse to deliver with a doctor that didn’t want to treat me and that I did not want treating me. While I strongly disagree with the decision of this medical practice, I support their right to make it. I feel we cannot fight for our right to make our own choices while infringing on the rights for others to do so also. This lady was not in a position where she was going to be denied medical care when she needed it. Doctors are people also, with their own concerns and obligations. I feel it is very important not to take away their choices and options either, however misguided they might be made. I have also had doctors wanting to treat me more holistically, but that were legally hampered to do so, having everything dictated to us by bureaucrats is not the way to go. If we want practices that are not into medical bullying and agree with our approaches we have to make informed choices when selecting them.